Fun, healthy level of competition for every age, skill and experience level. The NCJGA is great for boys and girls all ages and skill levels as we host events at both Executive and Championship length golf courses all year long. Each event is divided by age groups and gender first, then players are paired by experience and skill levels when possible. 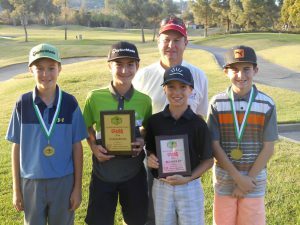 NCJGA Members may earn Player of the Year points for each tournament. Our Tournament Schedule is available online through our BlueGolf platform. You can register as a guest or become a member anytime. The NCJGA is to introduce the game of golf to boys and girls ages 5 to 18 by offering affordable, fun, and competitive golf events and instruction for all skill levels! This has been since 1965!! Our unique two tour systems allows us to hold events for all ages and skill levels. Tournament Players to our new Player Development Flight we love watching the kids grow up and their game develop!